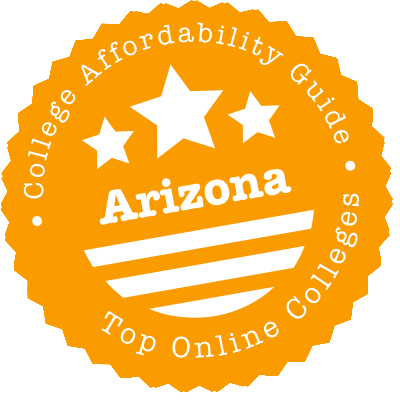 Scroll down to see the top not-for-profit colleges and universities in Arizona offering online degree programs. More than half the students enrolled at Rio Salado College take online classes, more than 650 courses can be taken online. So it's no surprise that courses for almost every degree and certificate are available online. Rio Salado, part of the Maricopa Community Colleges, offers a range of online associate degrees that meet Arizona transfer guidelines. The college has transfer partnerships with the three biggest universities in the state, and with more than 40 schools overall, making it easy to transfer credits to a new school. Most courses are offered in a traditional semester format, but students can also find some accelerated courses that cover the content in eight weeks. Northern Arizona University offers more than 90 undergraduate, graduate, certificate, and endorsement programs that can be pursued completely online or via a blended format. There are close to 50 undergraduate degrees currently offered, including 17 Bachelor of Science programs in fields such as education, criminology & criminal justice, dental hygiene, health sciences, nursing, and hotel & restaurant management. The Bachelor in Business Administration program offers five areas of emphasis: entrepreneurship & small business, global business, logistics and supply chain management, management, and marketing. Students pursuing the online Bachelor of Interdisciplinary Studies can choose from several concentrations such as early childhood, public administration, law enforcement, technology management, and justice studies. On the graduate level, NAU offers Master of Education degrees in 10 fields, including bilingual & multi-cultural education, educational leadership, elementary education, and educational technology. There are 18 graduate and 6 undergraduate certificates offered online. A Doctor of Nursing Practice degree is also available. Non-Arizona residents who are taking all their NAU courses online are eligible for the World Wide University tuition program. Under this program, students pay only 1.5 times in-state tuition instead of full out-of-state rates, thus saving more than 35 percent in total tuition cost. Students at Pima Community College can complete the Arizona General Education Curriculum (AGEC) certificate and earn an associate degree for transfer to a four-year college. PCC has different AGEC certificates, depending upon whether the student wants to study liberal arts, sciences, or business. The arts and business certificates are available online. Additionally, students can earn transfer associate degrees in their desired major. PCC also has "direct employment" programs for students seeking more immediate jobs skills. Online direct employment options include teacher education, health information technology, and business. About one-quarter of students at Mesa Community College take advantage of online classes as they work toward their goals of completing coursework for transfer or gaining job skills. Nearly half of students at MCC plan to transfer to a four-year college, so it's no surprise the most-awarded degrees are Associate in Arts, Associate in Science, and Associate in General Studies. All these programs and any more, 30 degrees and certificates in all, can be completed entirely online. Online career programs cover topics such as business, criminal justice, and emergency management. About 500 classes are delivered online in an asynchronous format for maximum student flexibility. All programs offered through UA Online can be completed 100 percent online. Bachelor of Arts degrees are available in Africana studies, communication, history, information science and e-society, philosophy, and psychology. Students who are interested in earning a Bachelor of General Studies degree can choose from several study areas such as arts, media and entertainment, economy and industry, and global and intercultural understanding. Currently, the university offers three Bachelor of Science programs - BS in Care, Health, and Society, BS in Geographic Information Systems Technology, and BS in Literacy, Learning, and Leadership. The College of Nursing offers an RN to MSN program (MS in Clinical Systems Leadership) in addition to DNP and PhD in Nursing degrees. The online Master of Business Administration program offers concentrations in finance, marketing, management information systems, and management and organizations. Master of Science programs are available in a number of fields such as electrical and computer engineering, optical science, and photonic communications engineering. UA currently offers 25 graduate certificate programs, including applied nutrition, business intelligence and analytics, digital information management, and family nurse practitioner. Eligible UA Online students can apply for the Qualified Tuition Reduction (QTR) or the Educational Assistance Program (EAP) from the Arizona Board of Regents. Yavapai College is a public two-year community college whose online offerings can be grouped into two categories: those designed to transfer and those that are standalone degrees or certificates. In the former category, the school has several associate degrees as well as two certificates that cover the entire Arizona General Education Curriculum, leaving graduates free to pursue all other classes at a public university in the state. As for the latter, the school has a few more associate of applied science degrees, mostly in business and management. The 15+ certificates cover similar ground plus get into criminal justice and writing. The outliers are the school's video game development programs. For students in need of flexible schooling options, Arizona State University offers 49 undergraduate degrees, 43 graduate degrees and 15 certificates in an entirely online format. ASU's online curriculum includes a large number of business undergraduate degrees, with six different concentrations offered. The online curriculum for engineering graduate degrees is just as extensive, with six different concentrations offered as well. ASU uses Blackboard as its digital learning platform and encourages students to collaborate through other technological tools like Google Drive. Arizona Western College has more than 100 degrees and certificates, and some classes for many of these programs are available in an online format. Classes are delivered in a range of modes, including 100 percent online, hybrid classes that combines face-to-face meetings with web-based coursework, and web-conference classes. Options include associate degrees for transfer students, an associate of applied science degree for individuals who want to gain career skills, and certificate programs that focus on specific skills. Certificate programs cover a range of topics, from paralegal studies to computer information systems to computed tomography. Scottsdale Community College scatters hybrid and online courses among its 150+ degrees and certificates. Students can search for the upcoming semester's offerings via the "Find a Class" feature on the Maricopa Community Colleges website. Unsurprisingly, the easiest courses to find are in the Computer Information Systems program, but there are plenty from other disciplines, including Culinary Arts, Dance and Exercise Science. By using the Shared Unique Number (SUN) System, they can also identify courses at the other nine Maricopa campuses that will transfer to Scottsdale CC. Cochise College has been honored in several rankings of best schools, including making the top 150 in the 2017 rankings for the Aspen Prize for Community College Excellence. Of equal importance to students who plan to transfer, the college has transfer agreements that allow students who complete an associate degree to seamlessly transfer to three state universities and a variety of out-of-state schools. Students who are planning to transfer to a four-year school can finish most of their general education requirements and even start work on their major while at Cochise. Online associate transfer degrees are available in about a half-dozen fields, including economics, English, and business administration. As part of the Maricopa Community College network, Chandler-Gilbert embraces online courses, if not fully online programs. The college's online courses are listed within the Maricopa website's catalog, as are "SUN System Courses" that transfer between Arizona's community colleges and four-year universities. Chandler-Gilbert has scores of associate degrees and certificates spanning a dozen academic departments, from Aviation and Applied Technology to the transfer-friendly Social and Behavioral Sciences. The college places hundreds of class sections online each semester. Most of the online degrees offered by Mohave Community College are transfer degrees for students who want to transfer to a four-year college and finish a bachelor's degree. Associate degrees are available in business, general studies, and several of the liberal arts and sciences. MCC Online also has some degrees and certificates for students who want job skills they can use immediately. Associate of Applied Science degrees available include accounting, computer graphics, and entrepreneurship. Certificates, which require fewer class credits, are offered in the same or similar fields. MCC Online also has two paralegal programs, an AAS and a certificate, that have some classes with live online meetings, which are not required for other programs. Estrella Mountain is one of the Maricopa Community Colleges, which collectively host hundreds of online and hybrid courses. The Arizona junior college's online courses can be found by using the "Find a Class" feature on the Maricopa system's website. Students can also search for transferable courses within the system by clicking the SUN System Courses box. Estrella Mountain's associate degree and certificate programs fall within 10 divisions - from Modern Languages to Occupational Education - and all of them feature online courses. In 2018 alone, the school facilitated over 350 online sections. As part of the Maricopa Community College system, PVCC publishes its upcoming online classes via the "Find a Class" feature on the Maricopa website. By clicking on the SUN System Courses box, PVCC students can also find online courses at other Maricopa campuses that will transfer to PVCC. The school offers academic certificates, certificates of completion, associate in applied science degrees, and general education degrees. The last group is for students looking to transfer to a four-year program. Pretty much all programs have some online classes, though none are advertised as fully online. However, students looking to stay off-campus can likely cobble together a general education degree if they are flexible with course selection. Arizona may be the land of online choice, but we know it can be tricky to decide on a program. For example, which public university has the best reputation? Could you earn an online degree at an Arizona community college first? Are there special discounts available for distance education learners? How do you know if a program is regionally accredited? To answers all these questions (and more), we’ve assembled this short guide to choosing an online program in Arizona. It has details on U.S. News & World Report rankings, credit transfers, free tuition programs, affordable schools, and online schools that have issues with accreditation. We’ve also listed a few useful links to distance learning websites. Arizona is dominated by three regionally accredited universities with online offerings: Arizona State University (ASU), Northern Arizona University (NAU), and the University of Arizona (UA). Happily, all of them participate in the Quality Matters (QM) Higher Education Program, which is designed to certify the quality of online courses. ASU often does extremely well in U.S. News & World Report rankings for ASU Online Programs, including high placings for both online bachelor’s programs and graduate programs. These distance education rankings handily beat UA and NAU, but we should point out that UA only started offering online bachelor’s degrees in 2015. So take these numbers with a grain of salt. Mesa Community College has developed three online Arizona General Education Curriculum (AGEC) paths for aspiring BA, BS, and BBA students. Rio Salado has created RioLearn, a custom-built e-learning management system. In 2016, Pima Community received a $100,000 distance learning grant to create textbook-free online degree programs using high-quality, open educational resources. Even better, AZ Transfer gives students step-by-step instructions and tips on how to transfer from an Arizona community college to ASU, NAU or UA! You can use the handy Course Equivalency Guide to see which community college courses qualify. In 2015, ASU formed a partnership with edX to create the Global Freshmen Academy. This allows students to take university freshman-level courses, for credit, without an application or transcript. These online courses are open to anyone who is interested. ASU has an unusual partnership with Starbucks called the Starbucks College Achievement Plan. The coffee company covers the full tuition (all four years) of any eligible part-time and full-time employee who wishes to earn a bachelor’s degree through ASU Online. Students have access to coaching and 24/7 tutoring on a variety of subjects. To come up with this list, we assessed each Arizona university on a variety of criteria, including quality, flexibility, price, and use of financial aid money. These are the schools that made both our “Top Online” and “Most Affordable” lists. (You’ll see a CAG Score next to their profiles in our ranking.) If you’re torn, we also recommend you check the school’s graduation rate and debt load on College Scorecard. ASU Online charges a standard rate for undergraduate & graduate online degree programs. The cost is fixed regardless of residency status and there are no additional program fees. Students have one week to decide if they wish to withdraw and receive a 100% course refund. According to the university, more than 7 out of 10 ASU students receive some form of financial aid. The school is also known as being military friendly, and ASU Online offers a specific Military Active Duty and Reservist Commitment Scholarship for undergraduate degree-seekers. UA Online is built on the back of the university’s status as a land-grant and research institution, with an emphasis on STEM subjects. It has a fixed rate per credit hour, which means in-state and out-of-state students pay the same tuition. Online programs include access to free tutoring, coaching & employment preparation. Many undergraduates (e.g. 85%+) receive some sort of financial aid. Are you a UA employee or related to one? You may be eligible for one of UA’s tuition reduction programs. Have you taken classes at UA before? Undergraduates returning after an absence of three years or more can apply for the Second Start Readmission Program. Whichever school you’re considering, always check to see that it is fully accredited by an organization recognized by the U.S. Department of Education. Although national accreditation applies to distance learning institutions, regional accreditation is preferred—especially if you’re trying to transfer credits. The Higher Learning Commission (HLC), formerly known as the North Central Association of Colleges and Schools, is the body responsible for regionally accrediting Arizona institutions of higher education. This list includes universities and community colleges. The website allows you to search for HLC-accredited institutions by state. The “Public Disclosure Notice” under the school name will tell you if the institution has been placed on notice, sanctioned, or put on probation. You can also check for regional or national accreditation status using the Council for Higher Education Accreditation (CHEA) Database. We list a couple of Arizona’s online schools with accreditation issues below. Now known as the Southwestern Assemblies of God University (SAGU) American Indian College, this private Christian college lost its HLC accreditation in 2015. ACU was placed On Notice by the HLC in November 2016 because it was at risk of being out of compliance with accreditation criteria. This Notice period lasts for up to two years and the institution remains regionally accredited while it addresses HLC concerns. PCC is regionally accredited. In 2015, the HLC removed its probation on the Pima County College District in Tucson, but it continued to keep the college On Notice. It stated that although PCC had made considerable progress, the institution remained at risk in certain areas. If the college makes acceptable changes, then the HLC will remove the notice. University of Phoenix is a for-profit institution headquartered in Arizona, with multiple campuses across the country. According to the CHEA Database, the University of Phoenix is regionally accredited by the Higher Learning Commission (HLC). However, according to College Scorecard, graduation rates for all of its campuses are extremely low. UOP has also been the target of class-action and whistleblower lawsuits. The University of Sedona does not appear in College Scorecard or the CHEA Database, and it holds no recognized regional or national accreditations. Sedona is owned by International Metaphysical Ministry, which also runs the University of Metaphysics. The Higher Learning Commission (HLC) is the regional accrediting body for Arizona universities and community colleges. It’s very easy to search for HLC-accredited institutions by state. Greater Arizona eLearning Association (GAZeL): GAZel is a non-profit industry organization that’s designed to connect folks in the eLearning community. Stakeholders include eLearning providers, educators, policy makers, and related businesses & organizations.